25°C, sun and light S breeze. After work ride tracked with MapMyRide! Distance: 24.2mi, time: 01:33′, speed: 15.50mi/h. Another after work ride. Didn’t feel as sprightly as yesterday, but it felt okay. I suppose I was somewhat hungry at the time. 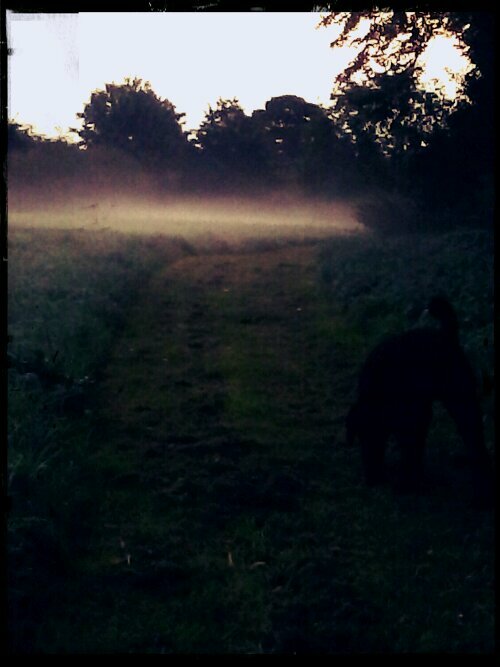 Photo- taken this morning at about 6.40. walking Rosie. Strange was that small patch of fog in the lower end of the field. It had cleared before we left. It’s here somewhere, I am sure. This entry was posted in Cycling, Dogs, Work and tagged Cycling, September, sunshine. Bookmark the permalink.